Preheat oven to 350°F. 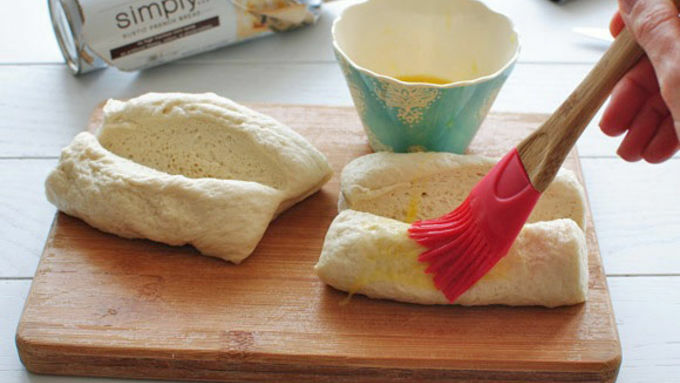 Roll the French bread out onto a lightly floured work surface. 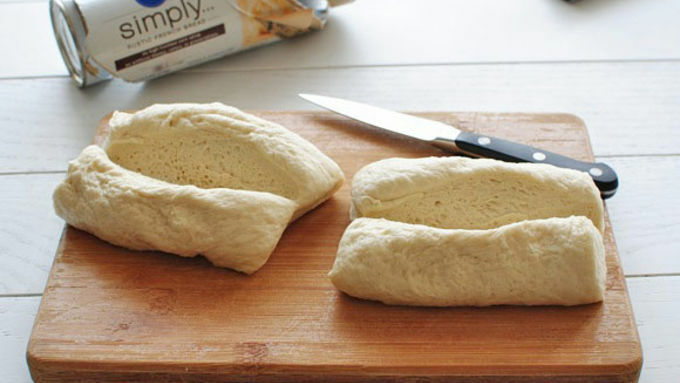 Using a pastry cutter, divide the loaf in half. Using a paring knife, cut a deep slit down the center of each loaf half, creating a hoagie. Beat one of the eggs in a small bowl and brush the bread tops. Place on a greased baking sheet and bake for 23 to 28 minutes, or until golden brown. 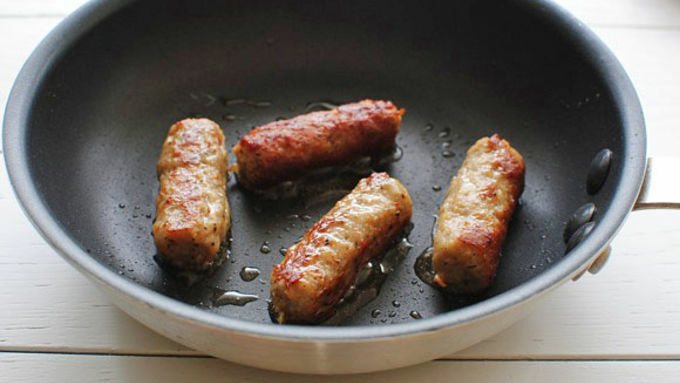 Lightly fry each egg in a teaspoon of oil in a small sauté pan until they reach your preferred doneness. Nestle each breakfast link inside each hoagie. Sprinkle with cheese, followed by the fried egg. Garnish with cilantro and serve immediately. What up, breakfast dog? (You can flick me.) I don't usually start posts off this way, but this is SO fun. This is SO.MUCH.FUN. Not like, a birthday party or anything, but the bread is actually fun to eat once it's baked. It absolutely KILLS any hot dog sloppy nasty bun out there, because it's freshly baked and golden and crispy on the outside and super duper chewy on the inside. And the yeasty-ness goes perfectly with the salty breakfast links. Or dogs. Whatever you want to call them. And then the little fried egg on top, omgggg. You can leave your yolks runny, which is the best way to go, but since I'm knocked up I had to cook mine all the way through. Not AS fun as it could be, but still, a whole boopidy boo of fun. 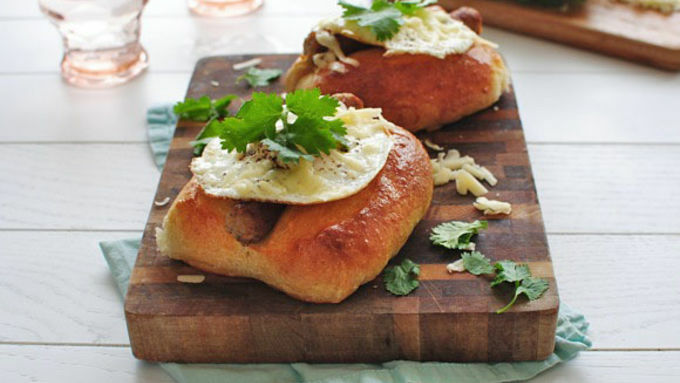 And then the shredded white cheddar cheese combined with the sausage and french bread cushions, hoooooooooly. SO fun. You like fun, right? What you've done is just nestled the links down in the baked bread (brush the bread with the egg wash again half way through baking! 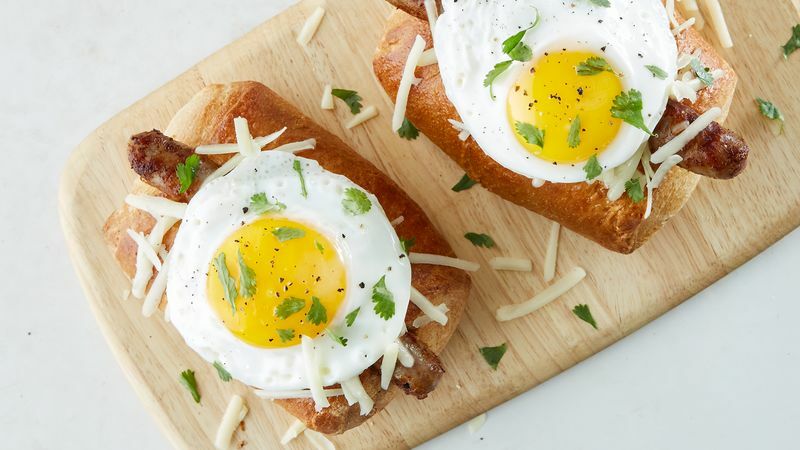 ), topped with your egg, cheese and a little bit of cilantro. Ohhhhhhhhh this is so good. Okay, fine. Our trees look better after the trim. Who wants a (breakfast) dog? !